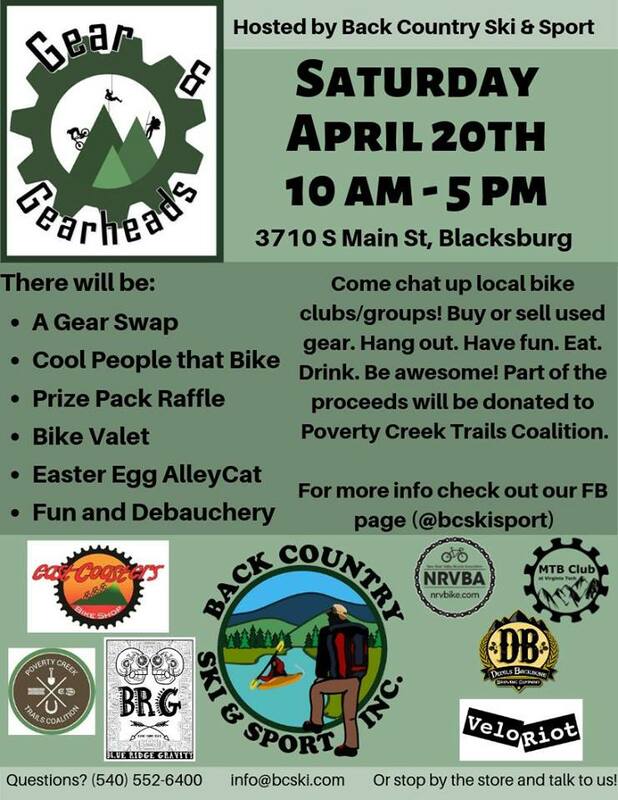 Back Country Ski & Sport, Inc. presents the first annual Gear & Gearheads Gathering on Saturday, April 20, 2019 at their Blacksburg, VA location. This event will combine a gear swap with a celebration of the local bicycling community. There will be a $5.00 raffle with prizes from East Coasters, Devil’s Backbone, Osprey Backpacks, NEMO equipment and more! Come sell or buy used gear, chat up local bike organizations, join the Alleycat Easter Egg Hunt, or just hang out and have fun! Proceeds will be donated to the Poverty Creek Trails Coalition. We encourage attendees to bike commute to the event. To view the event flyer, visit: https://i.imgur.com/tMxSxKU.jpg. Back Country Ski & Sport, Inc. is located at 3710 South Main Street in Blacksburg, VA.
For more information, visit: https://www.facebook.com/BCSkiSport/ or https://www.facebook.com/events/360136914609834.